With the major news and events in September coming right at the end of the month I have delayed this issue a little to capture them. These include the Australian Champs Carnival, incorporating of course the Southern Cross Challenge, and then this last weekend the final round of the 2017 IOF World Cup where Tim Robertson produced probably his best ever forest run in the middle distance. Also, the second part of thoughts on what we can do to improve NZL performances. The 2017 Oz Champs Carnival, based in and around Bathurst, started with the sprint distance at the Bathurst campus of Charles Sturt University. This was the first race in the Pinestars – Bushrangers Test Match with the contorted courses around and among the complex of buildings requiring multiple rapid changes of direction and close map reading. At the end of the day scores stood at 2-2 with both the NZL M21E and W20 teams being victorious, but with the W21E and M20’s well behind their Australian counterparts. Individual highlights came from Matt Ogden and Meghan drew who both placed 2nd, in M21E and W20 respectively. M21E: 1. Peter Hodkinson (VIC) 14:41, 2. Matt Ogden (NZLP) 15:35, 3. Tomas Kraica (ACT) 15:42, 6. Cameron Tier (NZLP) 15:55, 7. Duncan Morrison (NZLP) 16:19. W21E: 1. Natasha Key (AUSB) 14:10, 2. Belinda Lawford (AUSB) 14:39, 3. Krystal Neumann (AUSB) 15:09, 7. Renee Beveridge (NZLP) 15:52, 8. Greta Knarston (NZLP) 15:58, 13. Tessa Ramsden (NZLP 17:37, 20. Sarah O’Sullivan (NZLP) 19:00. M20E: 1. Aston Key (AUSB) 15:37, 2. Joseph Dickinson (AUSB) 15:49, 3. Simeon Burrill (AUSB) 16:08, 4. Cameron de L’Isle (NZP) 16:45, 5. Kurtis Shuker (NZLP) 16:51, 8. Joseph Lynch (NZLP) 17:04, 9. Max Griffiths (NZLP) 17:04, 12. Stephen Harding (NZLP) 17:36, Daniel Monckton (NZLP) mp. W20E: 1. Tara Melhuish (AUSB) 16:19, 2=. Meghan Drew (NZLP) 17:06, 2= Caroline Pigerre (AUSB) 17:06, 4. Carolyne Nel (NZLP) 17:15, 5. Marina Comeskey (NZLP) 17:26, 6. Marisol Hunter (NZLP) 17:56, 7. Briana Steven (NZLP) 18:04, 12. Heidi Stolberger (NZLP) 18:39. The following day focus moved to the middle distance run in a mixture of intricate gold mining terrain and vague gully-spur. Gold mining terrain is not so familiar to New Zealand athletes with Naseby and a few other places in the central South island being the only similar areas which we have. This unfamiliarity probably showed with all four classes going the way of the Australians. Again there were some good individual performances with Matt repeating his 2nd place from the sprint, and being joined on the pium by Cameron de L’Isle (2nd in M20) and Briana Steven (3rd in W20). However, for the second successive day all four NZL W21E’s finished behind all four of their Australian counterparts. M21E: 1. Peter Hodkinson (VIC) 30:12, 2. Matt Ogden (NZLP) 31:41, 3. Simon Uppill (AUSB) 32:14, 6. Duncan Morrison (NZLP) 35:55, Cameron Tier mp. W21E: 1. Belinda Lawford (AUSB) 32:57, 2. Krystal Neumann (AUSB) 14:39, 3. Charlotte Watson (ACT) 34:12, 9. Renee Beveridge (NZLP) 36:48, 10. Sarah O’Sullivan (NZLP) 38:27, 14. Greta Knarston (NZLP) 40:54, 15. Tessa Ramsden (NZLP 41:02. M20E: 1. Joseph Dickinson (AUSB) 26:56, 2. Cameron de L’Isle (NZP) 27:52, 3. Toby Watson (AUSB) 29:47, 7. Daniel Monckton (NZLP) 31:49, 8. Stephen Harding (NZLP) 32:21, 9. Max Griffiths (NZLP) 32:57, 10. Kurtis Shuker (NZLP) 33:08, Joseph Lynch (NZLP) mp. W20E: 1. Tara Melhuish (AUSB) 31:01, 2 Caroline Pigerre (AUSB) 32:44, 3. Briana Steven (NZLP) 33:07, 6. Marina Comeskey (NZLP) 41:00, 9. Marisol Hunter (NZLP) 42:50, 10. Carolyne Nel (NZLP) 43:22, 19. Meghan Drew (NZLP) 50:53, Ellena Caudwell (NZLP) mp. For the long distance on 30 September, with only Renee Beveridge in the field New Zealand had no W21E team, and were also down to only 2 runners (Matt and Cameron tier) in M21E. The stand-out performances however, came in M20 and W20. Katie Cory-Wright pulled off a convincing victory in W20, by nearly 4 minutes, and Joe Lynch produced probably his best result at this level with a 2nd place, less than 2 minutes behind the vastly more experienced Aston Key. In the elite grades both Matt and Renee finished just outside the top three. M21E: 1. Simon Uppill (AUSB) 1:29:17, 2. Peter Hodkinson (VIC) 1:32:11, 3. Tomas Krajca (ACT) 1:35:17, 4. Matt Ogden (NZLP) 1:35:51, 8. Cameron Tier (NZLP) 1:42:33. W21E: 1. Natasha Key (VIC) 1:08:54, 2. Krystal Neumann (QU) 1:10:27, 3. Jo Allison (ACT) 1:12:51, 4. Renee Beveridge (NW) 1:13:06. M20E: 1. Aston Key (AUSB) 1:02:44, 2. Joseph Lynch (NZLP) 1:04:36, 3. Joseph Dickinson (AUSB) 1:06:24, 6. Cameron de L’Isle (NZLP) 1:11:12, 8. Stephen Harding (NZLP) 1:13:02, 12. Max Griffiths (NZLP) 1:17:27, 14. Daniel Monckton (NZLP) 1:20:41, 15. Kurtis Shuker (NZLP) 1:21:56. W20E: 1. Katie Cory-Wright (NZLP) 52:20, 2. Rachel Allen (AUSB) 56:12, 3. Caroline Pigerre (AUSB) 56:30, 4. Marisol Hunter (NZLP) 57:27, 6. Carolyne Nel (NZLP) 59:11, 8. Briana Steven (NZLP) 1:00:17, 9. Marina Comeskey (NZLP) 1:02:20, 13. Meghan Drew (NZLP) 1:10:20. As always the Carnival finished with the Australian Relay Champs. Despite having to shuffle teams around the New Zealand teams were highly successful winning M21E and W20 (where a second NZL team also took 2nd place in a sprint finish by 1 second), and finishing 2nd in M20. A special word for Georgina Dibble and Tegan Knightbridge, who not being in the W20 teams stepped up to run with Renee Beveridge in W21E. M21E: 1. New Zealand (Cameron de L’Isle, Matt Ogden, Cameron Tier) 1:47:44, 2. ACT 1:48:17, 3. Victoria 1:55:59. W21E: 1. ACT 2:03:38, 2. Queensland 2:19:55, 3. South Australia 2:31:00, 6. New Zealand (Renee Beveridge, Georgina Dibble, Tegan Knightbridge) 2:40:28. M20E: 1. New South Wales 1:44:33, 2. New Zealand (Kurtis Shuker, Stephen Harding, Joe Lynch) 1:46:29, 3. Queensland 1:50:13. W20E: 1. New Zealand 1 (Marisol Hunter, Marina Comeskey, Katie Cory-Wright) 1:50:38, 2. New Zealand 2 (Meghan Drew, Carolyne Nel, Briana Steven) 2:04:45, 3. Queensland 2:04:46. Just in from Australia is the final result from the Test Match. With the m20 relay ging to Australia 30-20, but NZL winning M21E 20-15 and the 1-2 in W20 giving NZL a margin of 35-15, the overall final results were that New Zealand won M21E and W20, with Australia taking out W21E and M20. So a 2-2 draw with NZL retaining the Aspen-Key Trophy! Zealand came in the sprint where Kurtis Shuker (Senior Boys) and Will Tidswell (Junior Boys) took gold, while Marisol Hunter, Meghan Drew and Lucy Burrell also had top 3 placings. 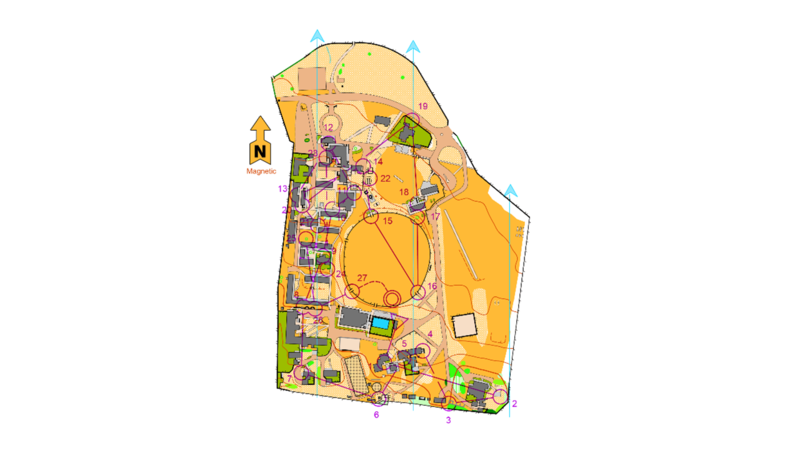 Although not as overtly technical as the Australian Champs sprint, the courses still made good use of a less complex array of buildings, albeit with a few very dead legs of running – perhaps shades of WOC sprints! In the long distance Will had to settle for 2nd in Junior Boys, withLucy (JG) and Carolyne Nell, in Senior Girls, taking third placings. 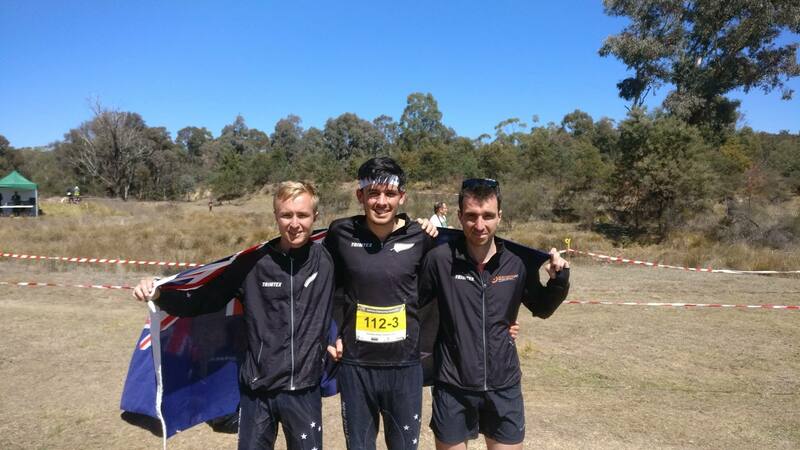 After the individual events New Zealand had already taken a healthy lead in the Southern Cross Challenge, and this was further extended in the relay, where the advantage of having all the good runners in a national team, rather than spread across the states was clear. New Zealand took out all but Junior Boys, with very healthy margins in both Senior classes. Senior Boys: 1. Aston Key (VIC) 40:31, 2. Tristan Miller (ACT) 46:02, 3. Alastair George (NSW) 47:45, 4. Joseph Lynch (NZL) 48:07, 5. Stephen Harding (NZL) 48:07, 14. Kurtis Shuker (NZL) 56:22, 18. Daniel Monckton (NZL) 59:38. Senior Girls: 1. Tara Melhuish (Act) 41:23, 2. Rachel Allen (TAS) 48:28, 3. Carolyne NEl (NZL) 49:32, 4. Marisol Hunter (NZL) 49:50, 6. Briana Steven (NZL) 55:15, 9. Meghan Drew (NZL) 57:17. Junior Boys: 1. Alvin Craig (NSW) 39:11, 2. Will Tidswell (NZL) 40:27, 3. Ryan Gray (QLD) 41:28, 13. Kieran Edwards (NZL) 52:24, 15. Michael McCormack (NZL) 54:06, 23. Jack Drage (NZL) 1:04:12. Junior Girls: 1. Joanna George (SA) 34:47, 2. Ella Cuthbert (ACT) 35:33, 3. Lucy Burrell (NZL) 35:38, 12. Sylvie Frater (NZL) 51:34, 23. Jessica Sewell (NZL) 1:10:14, 31. Anna Duston (NZL) 1:37:55. Senior Girls: 1. Tara Melhuish 16:06, 2. Marisol Hunter 16:49, 3. Meghan Drew 16:50, 7. Carolyne Nel 17:19, 8. Briana Steven 18:23. Junior Boys: 1. Will Tidswell 12:17, 2. Alvin Craig 12:24, 3. Ewan Shingler (NSW) 13;12, 10. Michael McCormack 14:54, 15. Jack Drage 15:50, Kieran Edwards mp. Junior Girls: 1. Zoe Melhuish (ACT) 12:18, 2. Joanna George 12:37, 3. Lucy Burrell 13:23, 6=. Anna Duston 14:21, 8. Jessica Sewell 14:27, 9. Sylvie Frater 14:41. With the Australian Champs on it has almost been easy to forget that the last weekend in September has been the final round of the 2017 World Cup. As for the last few years this has been in Switzerland, this year consisting of a long distance, a middle distance and a sprint relay. NZL has had only two athletes competing – Tim Robertson and Kate Morrison. Overall the interest was been in who was likely to take the individual titles. In the women’s field, pre-round 4, this appeared to be a contest between Tove Alexandersson and Russia’s Natalia Gemperle, with the Swede holding a 62 point lead. Among the men the contest was a lot closer with 50 points between Matthias Kyburz in 1st and Daniel Hubmann and Olav Lundanes in joint 3rd. Sweden’s Martin Regborn was sitting in second. Friday’s long distance was, as both Tim and Kate put it, probably the toughest long distance race they have run (see the next article!). Tim placed 67th in a field of 86th, with Kate 71st out of 79. 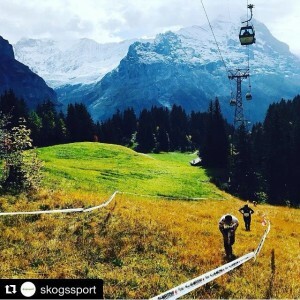 The snippet of the men’s map below shows a slalom downhill to about control 8 or 9 and then a long climb back up. 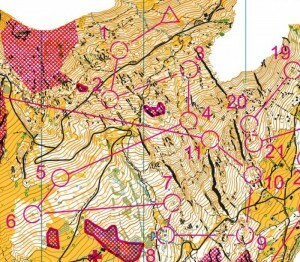 The full map (http://omaps.worldofo.com/?id=218357) shows a very long 11-12 leg followed by a nearly 3k leg from 14-15. The men’s winner on this mother of all tough courses was Kyburz with a 90 second advantage over Lundanes, Hubmann in 5th and Regborn not finishing. With Gemperle finishing 3rd behind Elena Roos and Sabine Hauswirth. With Alexandersson only managing 14th place the women’s title suddenly became a lot more interesting with just the final race to go. 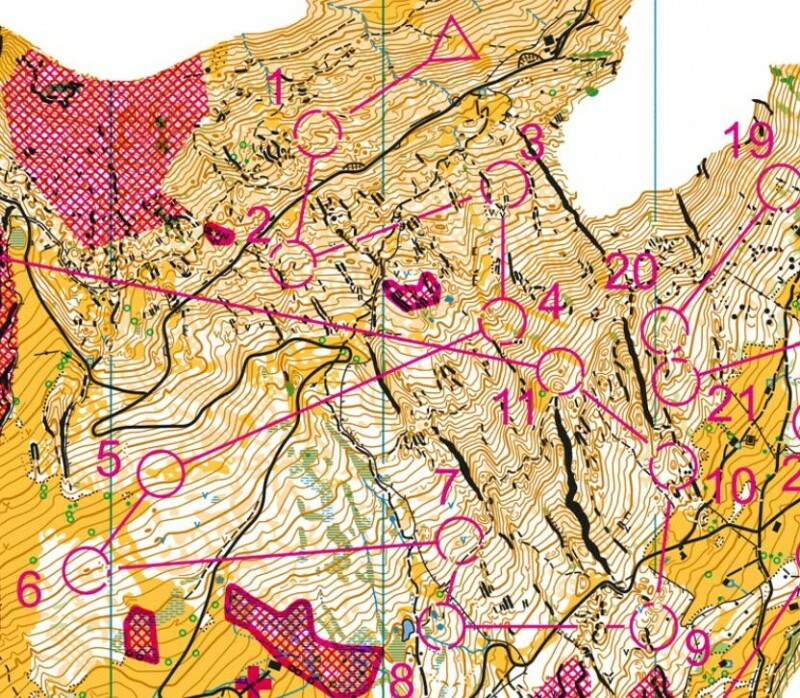 In fact Alexandersson, starting last, two minutes behind Gemperle, caught her quite early on in the course before making a mistake at number 6. She then re-passed Gemperle before having really major problems at number 9 and dropping well back. This was perhaps a bit typical of the overall Swedish day as, remarkably, only one Swede made the top 10 in each of the men’s and women’s races, and then in 9th and 10th places respectively. M21E (11.7k): 1. Matthias Kyburz (SUI) 1:23:35, 2. Olav Lundanes (NOR) 1:25:05, 3. Magne Daehli (NOR) 1:27:37, 4. Frederic Tranchard (FRA) 1:28:53, 5. Daniel Hubmann (SUI) 1:29:21, 6. Florian Howald (SUI) 1:29:31, 67. Tim Robertson (NZL) 1:52:11. W21E (7.7k): 1. Elena Roos (SUI) 1:10:02, 2. Sabine Hauswirth (SUI) 1:11:28, 3. Natalia Gemperle (RUS) 1:14:01, 4. Julia Gross (SUI) 1:14:12, 5. Marianne Andersen (NOR) 1:15:09, 6. Sigrid Alexandersen (NOR) 1:15:44, 71. Kate Morrison (NZL) 1:43:40. Saturday’s middle distance race saw Tim pull out his most impressive forest result yet at international level with an excellent 21st place, just under 5 minutes back from Kyburz who’se victory gave him his 4th overall World Cup title. Kate again found the going tough, finishing 73rd in the women’s field. After her problems in the long distance, Tove Alexandersson ensured that normal service was resumed with a 75 second victory over Roos, and comfortable ahead of Gemperle in 3rd. There was also some redemption for the rest of the Swedish team with four women finishing in the top 6. M21E (5.5k): 1. Matthias Kyburz (SUI) 33:31, 2. Daniel Hubmann (SUI) 34:27, 3. Emil Svensk (SWE) 35:28, 4. Olav Lundanes (NOR) 35:55, 5. Florian Schneider (SUI) 36:23, 6. Andreas Kyburz (SUI) 36:33, 21. Tim Robertson (NZL) 38:16. W21E (4.7k):1 1. Tove Alexandersson (SWE) 35:09, 2. Elena Roos (SUI) 36:24, 3. Natalia Gemperle (RUS) 36:58, 4. Karolin Ohlsson (SWE) 37:13, 5. Sara Hagstrom (SWE) 38:14, 6. Helena Bergman (SWE) 38:16, 73. Kate Morrison (NZL) 50:35. Tim’s result enabled him to finish 31st in the overall World Cup table with 105 points, a result very much based for the second year in a row on his wonderful sprint results throughout the series. The other Kiwis figuring were Lizzie Ingham, Laura Robertson, Gene Beveridge and Nick Hann, although their points were gleaned solely from WOC2017 which formed Round 2. Men: 1. Matthias Kyburz (SUI) 588, 2. Olav Lundanes (NOR) 468, 3. Daniel Hubmann (SUI) 463, 4. Martin Regborn (SWE) 384, 5. Vojtech Kral (CZE) 361, 6. Eskil Kinneberg (NOR) 296, 31. Tim Robertson (NZL) 105, 113. Gene Beveridge 4, 122= Nick Hann (NZL) 2. Women: 1. Tove Alexandersson (SWE) 679, 2. Natalia Gemperle (RUS) 610, 3. Sabine Hauswirth (SUI) 450, 4. Helena Bergman (SWE) 426, 5. Maja Alm (DEN) 380, 6. Elena Roos (SUI) 363, 64. Lizzie Ingham (NZL) 32, 99. Laura Robertson (NZL) 4. As appeared in the September issue of ONZ’s Compass Point, I have been having further thoughts on what steps we can take to improve out performances at specifically WOC, but also JWOC. Rather than, as last month, dealing with how we train our athletes physically and looking at such things as target times, thinking about what changes could be made to our programme to give more exposure to the kind of racing that is encountered at top international level. The first two impressions to me are that firstly, even our top athletes find the long distance races at these events much tougher than is generally presented at home, and, secondly, there is a clear indication that our top runners do not get enough opportunity to race in high pressure relays. To address these issues I am advocating that the Technical Committee adopt a few simple changes which would go some way to helping to rectify these issues. I commented on the length (or lack of length) for most New Zealand long distance events some months ago. There was a partial response at Waikaia at Southern O week where we saw truly tough courses, and the long distance at the Oceania Champs was also an exception, but getting used to the rigour and sheer physicality of the WOC long distance requires more than the odd event. So let’s increase the recommended winning times for long distance events for M21E and W21E (and arguable M20 and W20). I suggest 105 minutes for M21E and 90 minutes for W21E – times that represent the minimum times that NZL athletes are going to have to run for in the WOC long distance. Although the tail ends of the M21E and W21E fields would be out for much longer times, there are 21A grades at most major events for those in this category. The ONZ Champs is generally the WOC trial, so, at the very least, bring this in for the 2018 Champs in Auckland. Training camps can focus much more on relay training (including the sprint relay) but it is undeniable that the present format of the ONZ Relay Champs does nothing to help prepare our athletes for international relays. A solution that would go some way to rectifying this would be to add another class – a true elite relay. This would have 3 legs of equal length, of red difficulty, and require teams to contain both men and women (.e. 2M 1W or 1W 2M). Between our elites, 20’s and 18’s, not to mention the 35’s, nearly all clubs should be able to field teams that would give us a competitive relay on all legs. Such a scenario would retain the present Red Long relay, with a variety of leg lengths, but the additional class would much better cater for the elites and the top juniors. Again, let’s start in 2018. 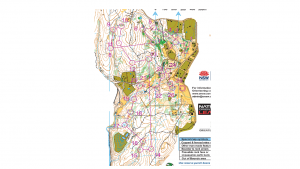 Orienteering is about more than the elites, but they how the world perceives New Zealand orienteering and they deserve a better chance to shine on the world stage, so surely we can do some restructuring that will better prepare them for international competition. Congratulations to Laura Robertson on winning the British Sprint Championships overnight.